The control system in which there is only one output of the interest is called single variable system. But in many practical applications more than one variables are involved. A control system with multiple inputs and multiple outputs in called a multivariable system. 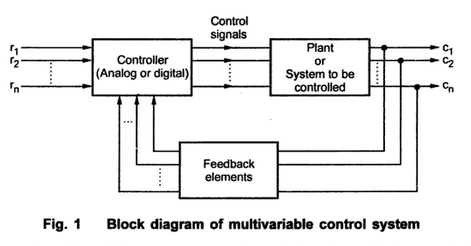 The block diagram representation of a multivariable control system is shown in the Fig.1 The part of the system which is required to be controlled is called plant. The controller provides controlling action depending on the reference inputs. There are n reference inputs r1, r2,.........rn . There are n output variables c1(t), c2(t), …… cn(t). the values of these variables represent the performance of the plant. With the help of feedback elements the closed loop control of the plant is also possible. Due to the feedback, the controller takes into account the actual output values to decide the control signals. In case of multivariable systems, sometimes it is observed that a single input considerably affects more than one outputs. The system is said to be having strong interactions or coupling. This coupling is nothing but the disturbances for the separate systems. The interactions inherently present between inputs and outputs can be cancelled by designing a decoupling controller. Thus the resulting multivariable system is considered to have proper number of single input single output systems and the controller is designed for each system. The another way is to design a controller which will take care of all the inherent interactions present in the multivariable system. In multivariable linear control system, each input is independently considered. Only one input and one output is considered and the total effect on any output because of all the inputs acting simultaneously is determined by addition of the outputs due to each input acting alone. Thus law of superposition is used to analyse multivariable linear control systems. In many particle control systems, control is achieved by more than one input and the system may have many outputs. In chemical processes simultaneous control of pressure, temperature and concentration is required by commanding various inputs. Air crafts and space crafts are other examples where movement is controlled by various inputs. Power generators, atomic reactors and jet engines are some of other examples of multivariable systems. 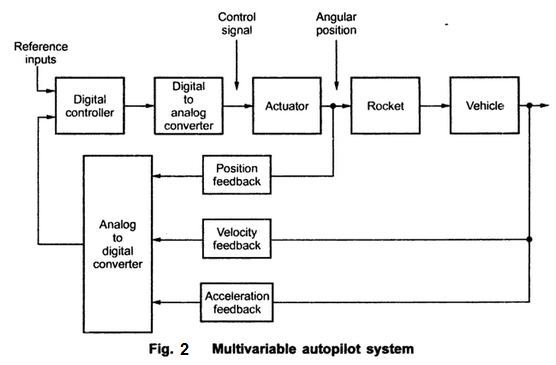 Consider the block diagram of multivariable autopilot system shown in the Fig.2. The system shown in the Fig.2 keeps a track of rocket vehicle in response to reference inputs given to it. The position, velocity and acceleration of the vehicle are fed to the digital controller using motion sensors. The controller takes appropriate decision and sends a controller signal which will drive the actuator, which will move the engine. Thus there are three output variables which are to be observed and controlled and there are corresponding reference inputs hence the system is multivariable system.